Who’s a celebrity boy then? Fame is a choosy mistress. It is clear from just a casual browse of newspapers, magazines and television that to be deemed a celebrity does not require talent, it is often a matter of coincidence and luck. Take the celebrity dog Nigel who potters around the garden at Longmeadow with his erstwhile owner Monty Don. He’s a fairly relaxed chap, with an easy way about him following a wheelbarrow with a spring in his stride and a wag of his tail. And his dog seems pretty chilled too. As co-hosts of Gardeners World the pair of them smile to camera every Friday evening while we sit and check what it is we should be doing in the garden this weekend. It’s not like we don’t already know, it’s just that we like affirmation that we are doing the same as Monty and Nigel. Needless to say I was a bit dis-chuffed when I saw the size of Monty’s potatoes in a bag, compared with my spuds in a bin, but we will gloss over that for now. But I look at my gardening companion Ella and I reckon she has all the talent of someone like Nigel and surely deserves some fame beyond the narrow confines of a gardening blog read by, well, tens. 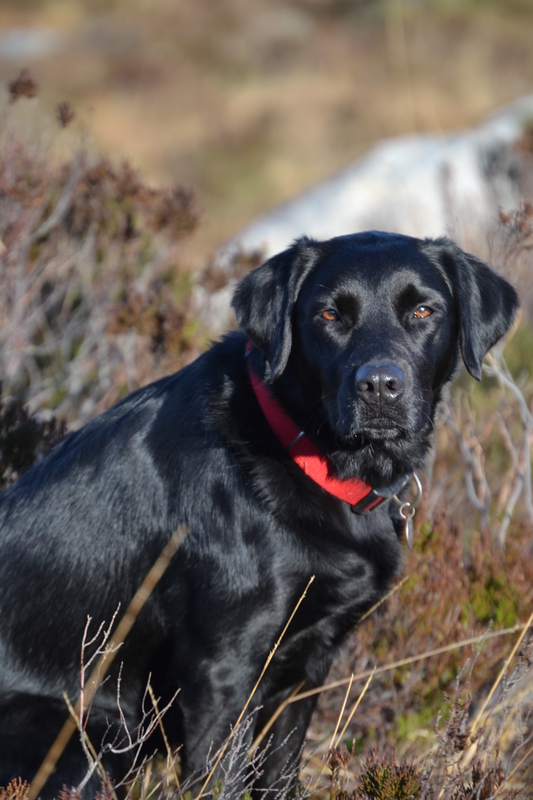 First off, she is a shiny sleek black lab: so much more stylish than the rather effete and, whisper it low – ginger – Nigel. (Strawberry blond? You’re having a laugh Nige). Ella potters around the garden and is very knowledgeable about all areas of the beds and borders particularly the spots frequented by rabbits. She actually despatches them occasionally too. She actively digs the garden, albeit the lawn, in pursuit of moles, leaving craters into which the mower has on occasion fallen. She can do cute, too, as she sits and stares into the middle distance, waiting for a rabbit to emerge beyond the tennis court; or alternatively she can tear up seed packets with the best of them. When all else fails, she can sniff out a ball and toss it triumphantly my way, demanding I at least pick it up to extricate it from the pot I want to use. And maybe – just maybe – I will throw it for her so she can demonstrate her retrieval skills and her ability to stop and turn, throwing up clods of earth from those parts of the lawn not already destroyed by moles. She clearly has the talent for TV. The pity of it is that the mere idea of fame seems to have gone to her head and she has skipped straight to the level of the self-absorbed star. Friday evening she disappeared up over the hill after we had fed the pigs and had to be tracked down by a stressed out Mrs B. And yesterday morning we came down to a vast amount of dog poo which had clearly come from the larger of our two dogs. It looked like two massive piles of large diameter black toothpaste. It’s fair to say there has been a long history of stars going missing (I never got to see The Clash in their heyday because Joe Strummer went walkabout mid-tour) and the examples of celebrities trashing hotel rooms are too numerous to mention; although crapping on your bedroom floor might have been a bit further than most celebs would go and I think Ella might have just been a trifle premature in taking on the self-indulgent high maintenance celebrity role. Until this blog goes viral she will just have to remain the most wonderful, chilled out labrador / retriever gardening companion any midlifegardener could hope for. Ella – who’s gonna dry you? This entry was posted in Gardening Times and tagged gardeners world, labrador. Bookmark the permalink.